All plants need moisture and nutrients to survive, but not all plants acquire them in the same way. Vascular plants such as vegetables, flowering plants, decorative shrubs and trees get what they need via tubes that pull water and minerals from the soil. Nonvascular plants, however, lack that type of plumbing and absorb moisture and nutrients directly through their outer surfaces. Both types can work together in your garden to facilitate the movement of moisture and nutrients among all your plants. Moss grows on a tree stump. Considered to be among the earliest plants, nonvascular plants -- mosses (Bryophyta), liverworts (Hepatophyta) and hornworts (Anthocerophyta) -- absorb moisture and nutrients by osmosis, a system that moves those substances back and forth through a thin outer membrane; the substances are stored briefly in plant tissues. Moisture and nutrients are released from the plants through a process called diffusion. Because mosses, liverworts and hornworts are so small, it doesn't take long for them to absorb their weight in moisture. Specialized openings called stomata, located on the plants' outer membranes, are designed to close partially when the maximum amount of moisture has been consumed, preventing its loss. Nonvascular plants grow everywhere, from hot, arid regions and cold, alpine areas to the arctic. Among the almost 10,000 kinds of moss are the narrow-leaved Atrichum (Atrichum angustatum), which grows in woods and on lawns, and the woodsy Mnium (Plagiomnium cuspidatum), which is common on large, shady areas of compacted soil. About 6,000 liverwort species exist. Common feather liverwort (Plagiochila porelloides) grows in mats on wet rocks or at the bases of trees in wet areas. Carolina hornwort (Phaeoceros carolinianus) is one of about 200 hornwort species. It has wide, leaflike growths and grows along wooded paths and rivers. Because they lack the mechanisms to absorb and store large quantities of water, mosses, liverworts and hornworts do not grow very large, exhibiting a maximum height in some cases of no more than 1 or 2 inches. Mosses, which are composed of thousands of tiny plants that grow tightly together, often appear to be dense carpets. Each tiny moss plant stands upright among the others, and the plants' compact growth habit assures the retention of moisture among them all. Liverworts and hornworts often appear to be small leaves growing flat on rocks or soil. Those two kinds of plants are very similar, differing only in their reproductive organs. Also, identifying species of some mosses and liverworts can be confusing because they bear very similar parts and often grow together in the same spot. 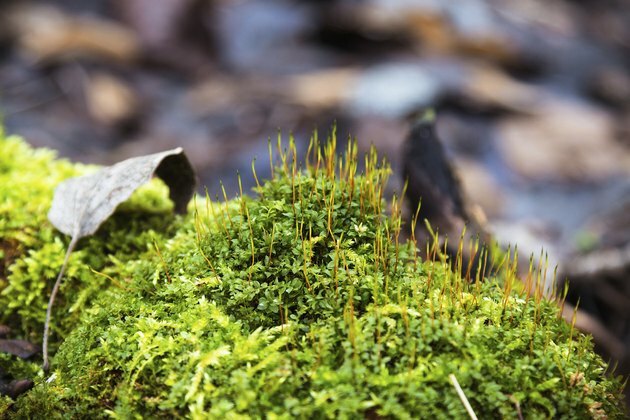 Mosses, liverworts and hornworts regulate temperature and moisture in their respective locations, according to a U.S. Department of Agriculture publication. The plants also enhance the nutrient cycle by collecting nitrogen-fixing bacteria and nutrients that are deposited by rain and dust. The presence of these plants in your yard generally indicates that the soil is moist and fertile enough to sustain other plant life, such as your favorite flowering annuals and perennials. Dense carpets of moss also foster the growth of mycorrhizal fungi, which -- with vascular plants' roots -- enhance plants' and soil's absorption of nutrients and moisture. Whether mosses grow naturally in your landscape or you introduce them yourself, their presence can benefit your entire garden.